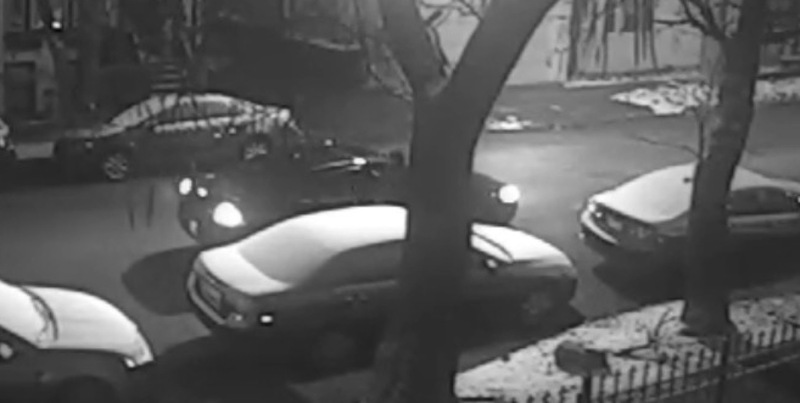 Police in the Town Hall District came very close to catching some of the North Side’s elusive catalytic converter thieves on Thursday morning. But the Chicago Police Department’s policy against pursuing vehicles in virtually all circumstances. Nonetheless, we have a description of their car as well as another vehicle that has been recently used by catalytic converter teams in the area. Also, a CWBChicago reader from Bucktown recently posted this video of a catalytic converter team in action. Any time you see a car double-parked with one occupant standing “lookout,” you can safely bet they’re up to something. Very often, the thieves will blast loud music from their vehicle to disguise the sounds of their power tools. 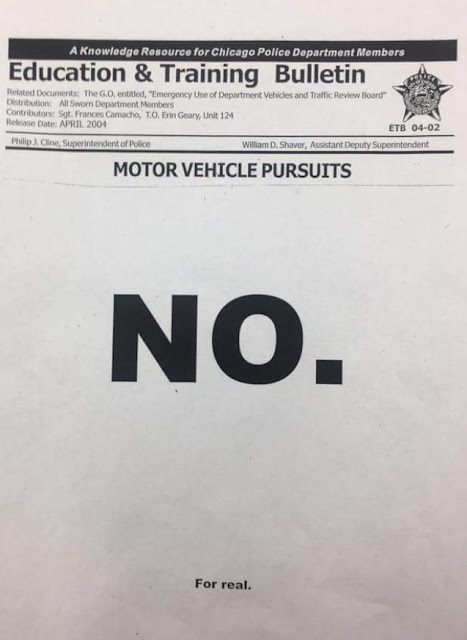 A parody of CPD's vehicle pursuit policy recently posted on Second City Cop. Officers were called to the intersection of West Cullom Avenue and North Winchester Avenue in North Center by a resident who saw the occupants of a black Infiniti sawing the catalytic converter off of a parked car around 5:50 a.m. on Thursday morning, Jan. 24th. Cops encountered the Infiniti as it turned onto Montrose Avenue minutes later. But the driver of the Infiniti refused to pull over. A 19th District supervisor ordered the officers to terminate the pursuit as the Infinity headed south past School Street on Ashland Avenue. Earlier this month, a witness provided police with a detailed description of a vehicle that was used by catalytic converter thieves near the intersection of North Hampden Court and West Deming Place in Lincoln Park. It was a 2018 Dodge Charger bearing a California plate that begins with 8CUB. The Charger, which is stolen, had three occupants. In a previous encounter with a different witness, one of the Charger’s occupants implied that they were armed with a handgun, according to a police department source. 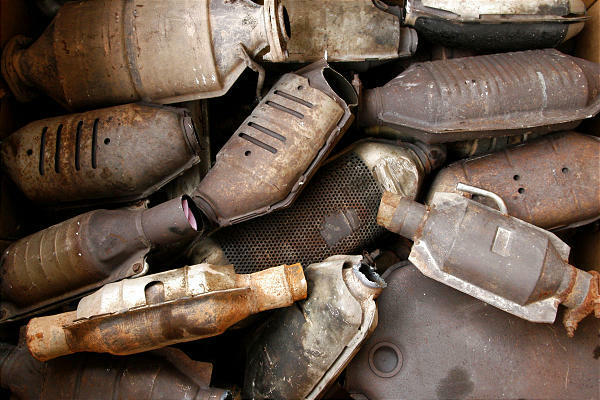 Thieves love stealing catalytic converters because the parts contain expensive metals including platinum and palladium that can demand payments of $100 to $200 at scrap yards. SUVs are often targeted because their high ground clearance makes it easier to access the undercarriage with a saw. Victims almost never know that their catalytic converter has been stolen until they start their car. That’s when they’ll be startled by a loud, roaring sound of their freshly-unmuffled engine. • Always park your car in a garage, if available. If not, consider parking with the driver’s side next to the curb.